The JCB Backhoe Loader is the iconic `yellow digger', variants of which have now been in production for over 60 years. This manual focuses on the classic 3C MkIII Backhoe Loader, which first appeared in 1977 - revered by enthusiasts, and the machine that took JCB from leading British manufacturer to a global player. The book is produced with the full cooperation of JCB, to coincide with the company's 70th anniversary, and makes use of the extensive JCB archive, featuring a wealth of photographs and behind-the-scenes detail. The yellow `JCB' has become a generic term for plant machinery, and in particular the Backhoe Loader - distinguished by its shovel/bucket at the front and rear backhoe attachment. 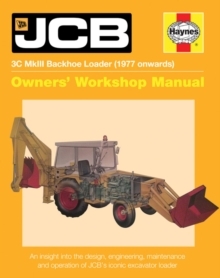 This manual tell the story of the Backhoe Loader - the bedrock of the JCB business - and provides fascinating insight into how the the 3C MkIII was built, developed and used, in addition to looking at how an example is maintained and operated today.